The Miami-Dade school board building in downtown Miami. WLRN News hired freelance reporter Susannah Nesmith to report the following story. WLRN News did not direct any of her reporting. That’s because WLRN News itself is a subject of the reporting. NPR edited the story. Listen to the story: Miami-Dade School District Superintendent Alberto Carvalho has abandoned attempts by his staff to take over the news operations of WLRN. Miami-Dade School District Superintendent Alberto Carvalho has abandoned attempts by his staff to take over the news operations of WLRN. Carvalho faced strong pushback from listeners and supporters of WLRN after news broke two weeks ago that his staff had insisted that the station’s journalists report to the district’s communications department. 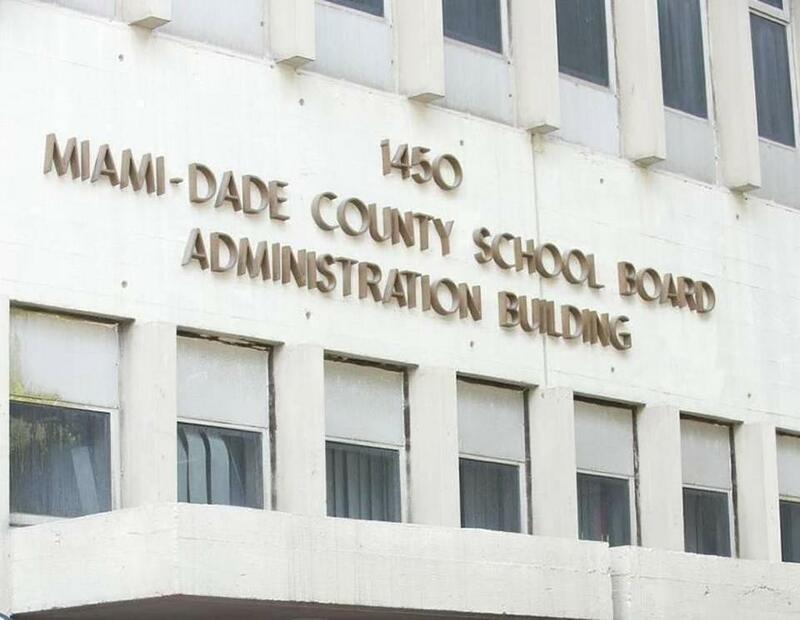 District communications director Daisy Gonzalez-Diego said the proposal was never meant to make it possible for the district to dictate coverage of the schools. But it was initially formulated after she became frustrated with WLRN’s coverage over the summer. “It was three stories that I kind of got upset about because I’m a journalist as well and I know we don’t put any stories on the air unless we got both sides,” she said. Daisy Gonzalez-Diego is a former journalist who worked in local TV news before joining the school district. When consulted about the stories in question, Tom Hudson, WLRN's Vice president of News, said: "As a matter of professional practice, the WLRN News department contacts sources it deems pertinent to each news story before a story is published or broadcast." She said the stories led her to dig into how WLRN was run. The district owns the license for the station but news staff work for an affiliate of Friends of WLRN. She said Carvalho was not available for an interview. He told the Miami Herald last week that he no longer supported the proposal, which was part of a draft operating agreement. Negotiations are still underway to forge an agreement between Friends and the district. “It was a first step in trying to come up with something that is mutually beneficial for both of us,” she said. Gonzalez-Diego defended the initial proposal by saying she and others thought the school district needed a way to reduce liability as the station's licensee. She said potential liabilities ranged from union grievances and student safety concerns to financial oversight. District staff held its first meeting to consider ways to force news employees to become district employees in early November. Then, in January of 2017, Friends discovered that a series of inaccurate financial reports were provided to the Corporation for Public Broadcasting. The Corporation has since ordered an audit. The station could have to pay back as much as $900,000 in grants, or even face fines. The financial irregularities made a new operating agreement more urgent, Gonzalez-Diego said. “As a licensee of WLRN, we have a responsibility to make sure that their transactions are transparent,” she said. “I don’t think we’re asking a lot for the finances to be made available.” But Friends already provides financial reports to the district. A review by a forensic auditor found that both Friends and the district failed to properly oversee the station’s finances. A district employee signed off on the grant applications with the wrong numbers. Friends chairman Dwight Hill says the nonprofit will pay the fines, if any are levied, and cover any deductions from future grants that are required to pay back the old grants. Friends has millions of dollars in reserves. Hill said he heard from donors who were unhappy about the proposal as soon as it made news. Others wrote letters to the editor and both the Miami Herald and the South Florida Sun-Sentinel condemned it in editorials as a power grab. Correction: The original version of this story reported that Friends of WLRN discovered accounting irregularities in late December. That’s when accounting reports were overdue. According to station management, the accounting irregularities were actually disclosed to the station on January 20th, 2017.